Abstract. We introduce a new Stata command, xtpmg, for estimating nonstationary heterogeneous panels in which the number of groups and number of time-series observations are both large. 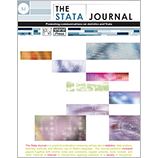 Based on recent advances in the nonstationary panel literature, xtpmg provides three alternative estimators: a traditional fixed-effects estimator, the mean-group estimator of Pesaran and Smith (Estimating long-run relationships from dynamic heterogeneous panels, Journal of Econometrics 68: 79–113), and the pooled mean-group estimator of Pesaran, Shin, and Smith (Estimating long-run relationships in dynamic heterogeneous panels, DAE Working Papers Amalgamated Series 9721; Pooled mean group estimation of dynamic heterogeneous panels, Journal of the American Statistical Association 94: 621–634).